Last evening, while I was puttering in the backyard, a blackbird fledgling hopped through the open door of the garden shed. My efforts to coax it out only caused it to scamper further into the dark recesses of my “woman cave.” All the while, the child’s mother was scolding me loudly from a nearby tree. When it was time to go in for the night, the little peeper was still in residence. Rather than locking him into the dark and stifling structure, I propped the door open a few inches to permit his egress at his convenience. I’m hoping, when I check the shed after work today, that I’ll find its population down by one, rather than up by an indeterminate number of snakes, mice, rabbits and other undesirable tenants. My mom worried that the little guy might fall victim* to a white cat that prowls the neighborhood overnight. However, based on my experience of bird-cat relations, I’m more hopeful. Despite anti-cat propaganda that puts cat-caused carnage against bird populations on a par with the Visigoths’ sack of Rome, I maintain birds can hold their own against their feline foes. In 2013, a controversial study in the journal Nature Communications postulated that cats are responsible for between 1.4 and 3.7 billion bird deaths a year. That does indeed seem appalling. But consider that the world population of birds is estimated at 400 billion, and the paltry .00925% that cats cull seems a little less egregious. Based on the cacophony of tweets and chirps that starts up about 4:30 am every morning outside my window, I can say with certainty that the winged creatures are not endangered species in my yard, at least. 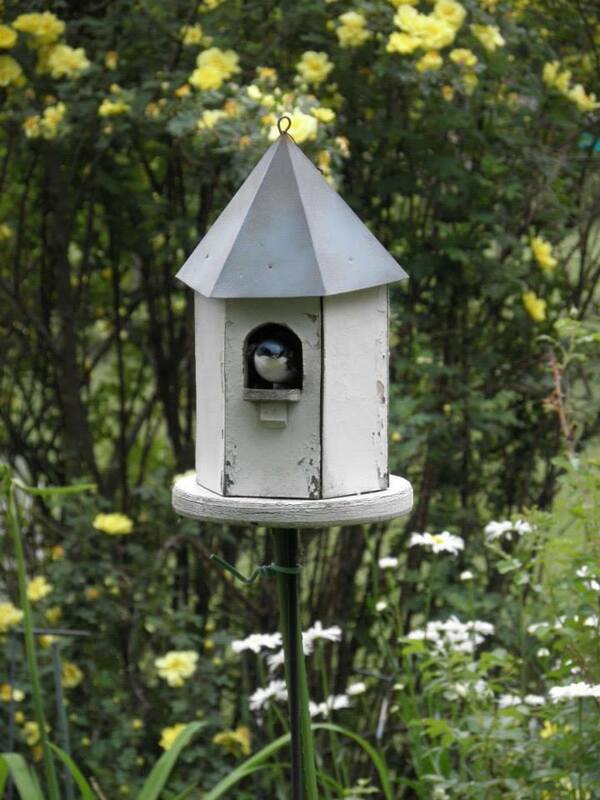 We maintain a congeniel habitat for our feathered friends. Indeed, my experience suggests that birds are often the bullies in cat-bird interactions. Last summer I witnessed the startling spectacle of a bright orange blur of cat streaking across the neighbor’s property at full speed, pursued by a trio of dive-bombing bluejays. The last I saw of the beleaguered feline, it dived under a camping trailer; the jays perched on top of the vehicle, laughing and pointing at their humiliated victim. 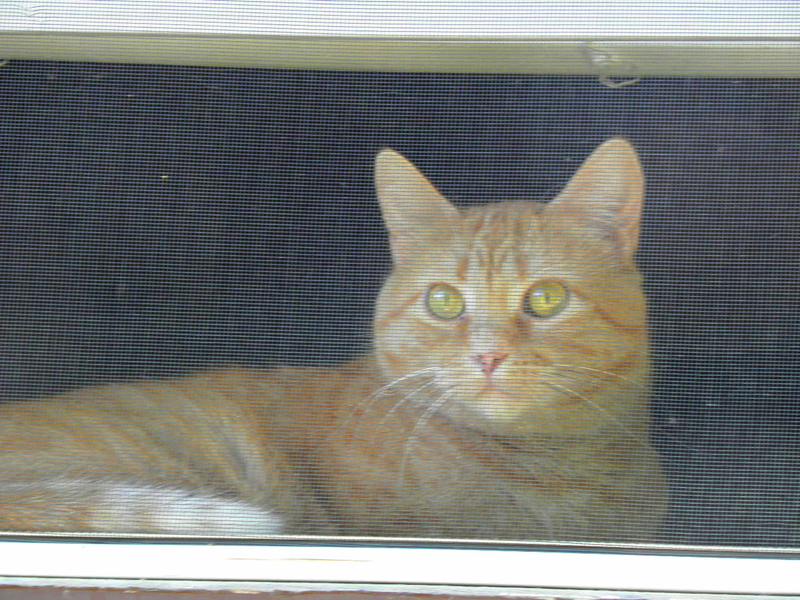 Peep, stymied by a fragile mesh of screen. 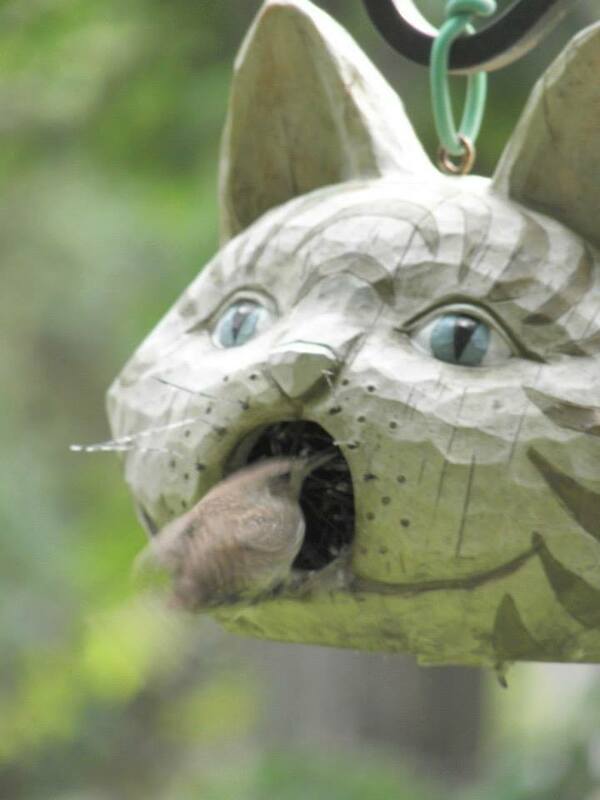 At left, the house wren, Troglodytes aedon. Not to be confused with Trog, the 1970 low-budget horror film that marked the low point of Joan Crawford’s career (right). Frankly, as stealthy as cats imagine themselves to be, a bird that allows itself to be snuck up on by a cat is, in my opinion, not much of a bird. Birds have the great advantage of wings, which allow them to flutter just out of reach of their earthbound enemies, who are left to shout in impotent rage and shake their furry fists toward the sky before stomping off petulantly to take a nap. Our swallow condo is always a hot property. *Sad coda: The fledgling apparently did leave the shed overnight, but was found some yards away, deceased of unknown causes. ** a group of crows is known as a murder, presumably because their raucous cries inspire homicidal thoughts in anybody who has to listen to them. Drama in the garden! LOVE IT!